We tend to think of technology as something that moves electrons around. But I'm going to take a little diversion into technology that is used to move us around (and yes, our electrons as well, you pedants). The humble bicycle has been in existence for roughly two centuries, and the general outlines of what we use today were in place by the early 1900s, so you'd be forgiven for thinking that not much has changed. I certainly hadn't given it much thought. I had to reevaluate that view when, in an effort to get more exercise, I decided to replace the bike that I had bought in the early 1990s. Just in shopping, it became apparent that a lot had changed—I faced decisions that I hadn't realized existed. Much of the underlying technology had transformed, and the changes generally solved significant problems. 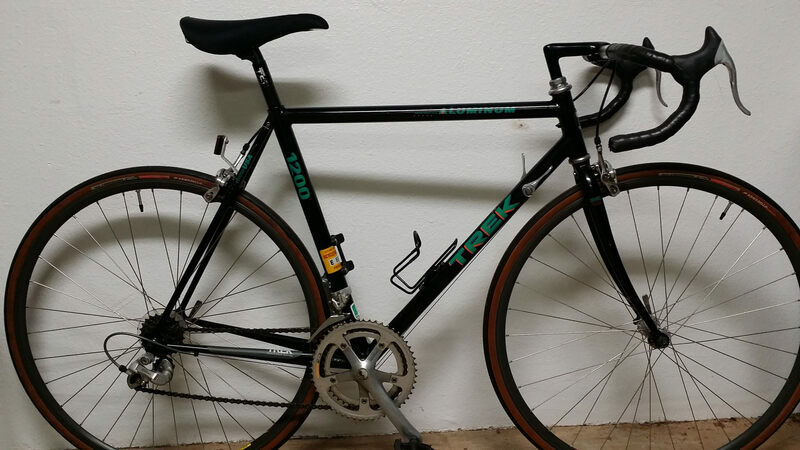 My old bike, a Trek 1200, was bought on a grad student's budget as a high-speed commute machine; adjusting for inflation, its successor was within about $200 of the same price. But it was like buying into a completely different world. So join me in a trip through a quarter century of cycling technology, with an emphasis on the hardware that's within most people's price ranges. The basic outline of wheels—a set of spokes holding a rim to a hub—hasn't changed unless you're looking at exotic materials and aerodynamics that come at a price that could buy you a decent bicycle. The innovations on mainstream wheels are relatively subtle but real. One of them is how the wheel meets the axle. My 1200 came with a freewheel design. In this configuration, there's a key asymmetry. On the side away from the gears, the spokes meet the axle where the axle meets the frame, meaning road stresses are transferred more-or-less directly to the frame. On the other side, the spokes meet the axle slightly off-center, while the gears (and the freewheel that allows them to rotate freely in only one direction) take up the space between there and the frame. This had the unfortunate effect of meaning the road stresses on the geared side were transferred directly to the axle, which had a tendency to snap. Fail to notice the axle snapping, and the frame would be under constant stress from the axle. Then the frame, too, would snap, which is something I'd experienced twice, though not with the bike in question here. Around the time I bought the 1200, however, higher-end wheels were being equipped with a free hub instead of a freewheel. In this case, the spokes attached to the free hub, which only contacted the axle next to the frame, as it did on the other side. Broken axles became a thing of the past (I upgraded to one of these as the prices dropped). On my '90s bike, the axle itself nested in a notch machined into the frame. It was held in place by a skewer that extended down the middle of the axle and could be screwed down on one side, clamped down with a lever on the other. This allowed a surprising degree of flex in how the wheel was aligned relative to the frame; it was rare to take your wheel off and get it back into proper alignment with the brakes without a bit of fiddling and re-clamping (more on that later). Like broken axles, those days are now gone. On current bikes, a machined hole in the frame on one side allows the axle to slide through and thread into a matching hole on the other side. There is only one way for your axle to fit, and it guarantees the wheel and everything on it lines up properly. Tires may also be in the process of switching technology, though I'm not convinced. My older bike had the standard arrangement: a robust rubber tire that you only replaced if it received a significant gash, and a thin inner tube that holds the air and could be pulled out and patched or replaced if it were punctured. The new one came with tubeless tires, which ia (like a car tire) held against the rims by air pressure that's forceful enough to have the rubber make a seal. No inner tube needed. In theory, at least. A good seal actually requires a mix of latex and solvent to be put inside the tire. Any small leaks let the solvent evaporate off at the site, sealing the area with latex. This kind of worked for small punctures, too. When I heard a hissing sound after getting home from a ride, I simply rotated the site of the leak to the bottom and left it. The latex sealed up, and the bike was ready to ride the next day. The next time I fully inflated the tires, however, that leak and one of its friends started hissing out latex. At that point, I emptied the tire and added an inner tube, which is what I'll stick with until the technology is better. Twenty-five years ago, bicycle makers bought tubes of whatever material—steel, aluminum, carbon fiber, even titanium—and then figured out how to link them up to make a bike. Geometry was mostly limited to what amounted to a series of triangles, and carbon fiber was pretty unaffordable. Now, carbon fiber comes in multiple grades, including one that has fallen into my price range. It's not mind-bogglingly weightless at that level, but it's light, strong, and can be easily shaped into a huge range of geometries. In the mean time, manufacturers have also figured out how to force aluminum into molds so that it, too, adopts any frame geometry you want (typically the same one as the carbon fiber). The geometry of the bike I bought more recently is primarily meant to limit the jarring of rough roads. For example, tubes once ran from the rear axle up to where the seat post slides into the frame, which transferred the force of jarring bumps directly to the seat. Now, they attach to the tube that holds the seat much further down, transferring more of that force into the frame. The seat tube is also much longer, allowing it to flex a bit rather than rattling you. Bicycle manufacturer Trek even has models in which the junction between these tubes is allowed to flex freely within limits. Another change is in the fork/handlebar attachment system. The tube that extends up from the fork used to terminate within the frame. The handlebars were attached via hardware that extended into the frame and could be expanded there by tightening a bolt that locked it in place. Now, the top of the fork extends above the frame, and the handlebars are clamped directly on, which seems simpler and more robust. My old bike came along at a time where the cables that handle the shifting and brakes were migrating from running along the exterior of the frame to being routed through the interior of the frame; only its rear brake cables were internal. Now, nearly all the connections are internal—and not all of them are cables. By the 1990s, the basic outline of brakes hadn't changed in decades: pull a lever, it pulls a cable that tugs on levers that press pads against the rim of the wheels. Simple and largely effective. Largely. You only need to ride through a few potholes to start hammering a wheel's rim out of perfect alignment, which could set it rubbing against the brakes as it spun. Remove the wheel and reseat it, and the problem could easily get worse. Brake pads would wear unevenly as a result, meaning if you fixed the rest of wheel, you'd still have problems. Plus the smooth, lightweight metals of the rim didn't always afford good sticking power, especially if wet. The obvious solution is to separate the wheel and braking system, and that's what disk brakes do. A smaller metal ring is attached to the wheel in a parallel orientation. It runs between a pair of pads nestled onto the frame or forks. Pull the brake lever, and the pads are pressed against it, providing tremendous stopping power. And, combined with the through-axle design mentioned above, reseating the wheel always brings everything back into perfect alignment. While early versions of disks brakes worked with the traditional cables, hydraulic systems do a better job of ensuring that the force imparted to the pads is distributed evenly. So hydraulics have replaced cable pulls pretty rapidly. Now, a squeeze of the brakes compresses a reservoir of oil in the brake handles, which translates the pressure through a tube to the brake-pad housing. Disk brakes haven't been accepted by racing's governing bodies yet, but I have no intention of racing. Instead, I paid a bit extra to have the greater reliability and reduced annoyance. I have not been disappointed. The gearing of my bike hasn't changed much; there are just more of them. When I was a kid, "10 speeds" were what you got when you were ready for a big kid's bike, with two gears up front and five in back. Now, I've got 10 options in back alone, and some bikes offer 3 rings of gears at the pedals. Shifting those gears, in contrast, is almost unrecognizable. My old bike had a pair of small paddles on either side of the frame; rotating these would pull or relax a cable, changing gears. After decades of stasis, the 1200 I bought in the '90s came with a new feature: indexed shifting. At certain points in their rotation, the paddles would click into a groove. If the cables are adjusted properly, the derailleur that moves the chain between gears would be lined up perfectly on one of them. For a little fussing with the cables at home to line everything up, you'd get fuss-free shifting on your rides. But again, at the time of my purchase, cycling was on the cusp of change. Index shifting would work with any system that changed the cable length by the right amount—paddles weren't needed. Manufacturers figured out how to put index systems inside the brake handles. Rotate the handles, and you could shift the gearing up an index. Rotate a small second handle, and it would drop back down one index. This all seemed like an unnecessary luxury until an unfamiliar hill climb steepened suddenly. I desperately needed to downshift, but I also couldn't afford to take my hands off the handlebars. This was precisely the problem gear-lever shifters were meant to solve; I eventually retrofitted my bike. This technology has now filtered down to even low-end road bikes. The bike is obviously a small part of what's changed. My new helmet fits better and has better air flow. Rather than small, portable pumps that don't work especially well, most riders now carry cartridges with compressed CO2 to re-inflate their tires after flat repairs. Clunky lights have been replaced with compact LEDs with rechargeable batteries built in. Cycling computers now live up to their name, integrating information from sensors that report speed, how quickly you crank your pedals, and even heart-rate monitors. Or you can just get a GPS unit that both tracks your ride and offers turn-by-turn instructions. For just a bit more, you can get a smart watch to do the same and some other stuff as a bonus. All of this has changed despite the bicycles and their accessories looking superficially similar, and all of the changes having been evolutionary. And it has added up to someone who has been very happy with his purchase. The trailer for Claire Denis' High Life For space-cinema fans, Spring 2019 has long had two big..